eBook w/ instant download INCLUDED! Download the Spring Issue of Art*full Mother right here for FREE. Enter in your information and when you submit, the site will email you a link to download your very own copy. Notify me about the Summer edition! 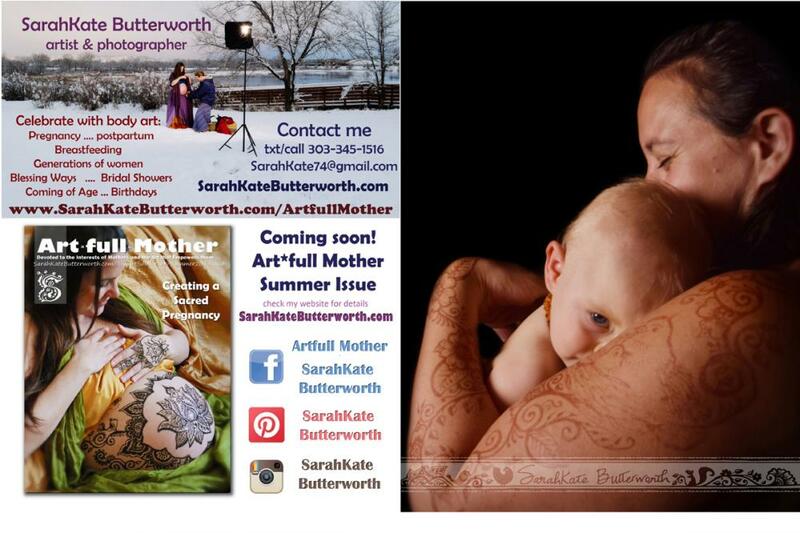 Purchase a full color printed copy of Art*full Mother magazine. Printed on quality paper, with true life color and 20 - 20 sharpness, this is coffee-table quality book, in a magazine. Purchase a print copy and get an eBook version, instantly. A magazine full of images that melt a mother's heart, where SarahKate Butterworth has captured not only the sacred bond between mother and child, but also created the body art that honors the mama's vision / feelings. These powerful images are part of an ongoing series, an art project that has involved over 500 women and began with books.... Many women absolutely love getting permanent tattoos, but during pregnancy and breastfeeding it's better to get temporary tattoos. Henna tattoos are a great way to ritualize this amazing rite of passage that all mothers go through. 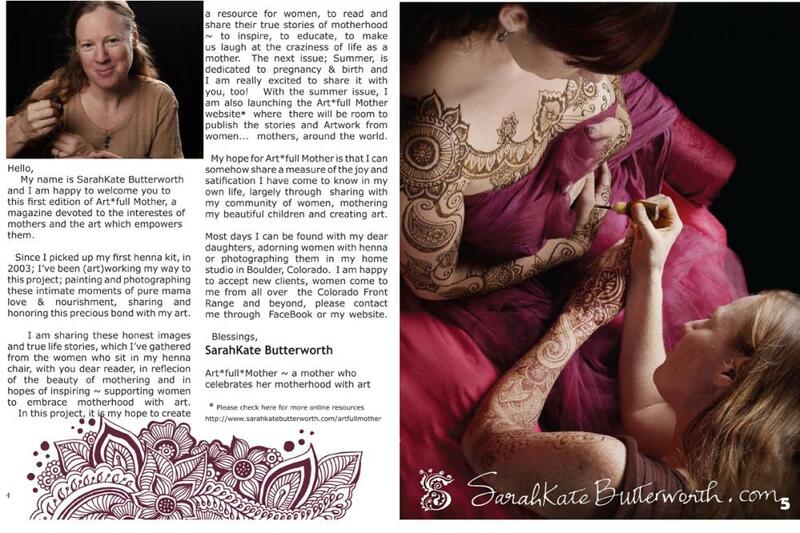 It's a moment in time to cherish, to set intentions .... Art*full Mother was borne form SarahKate's love of creating this type of body art and her desire to share some of the mothering stories she hears as women sit in her henna chair. This is the place to make a contributation to the comming issues to Art*ful Mother. We are looking for artistic contributions, created by / for mothers. Feel free to upload video, pictures, poems, songs and stories... Share your special events, wedding, birth & babies, raising kids and our parents too. Tell us about being in your family, or about your youngest or about your birth. Please share what you will, read and see what is here from others and rejoyce at being a living human being for another moment. While I do my best to post everything submitted here, I reserve the right to publish or not at my own discretion. Content of a sexual or violent content will not be published. Feel free to upload your art here. I am very excited to see what you have created and post it on the site to share with everyone. Thank you again!